Blue Topaz Silver Hook Earrings decorated with Gold Wire. These lovely sterling silver hook earrings are designed in an organic and fluid shape. 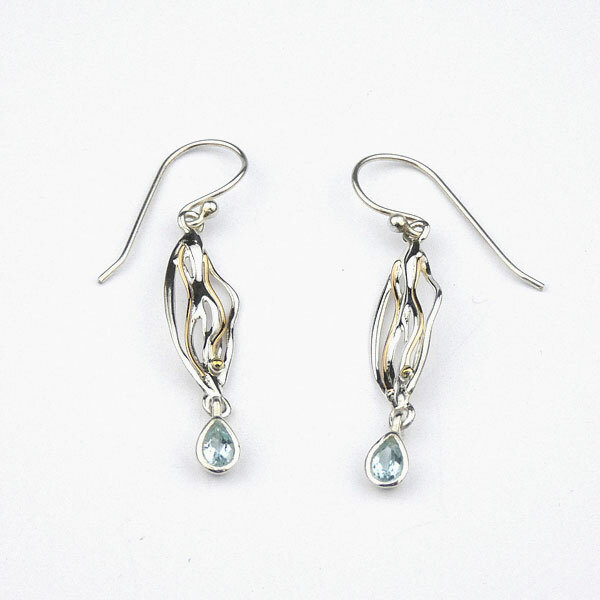 From the curved silver lines of the central design, overlaid with gold filled wire, hangs a teardrop of soft blue topaz. Length: From the top of the hook to the bottom of the earring, approx. 45mm. The earring itself is approx. 35mm. Width: at its widest the earring is approx. 10mm. These attractive items of original and innovative jewellery, are designed and made by Banyan in Devon. Made in 925 sterling silver, this very distinctive jewellery is often detailed with gold, copper or brass and frequently decorated with precious and semi-precious stones.